Sunbeam Auto is owned by the Hero Group who have a joint venture with Honda Ltd. Japan - Hero Honda is the largest two wheeler manufacturing unit in the world. The supplies by us are for direct use in the Hero Honda motor cycle. Cafoma Engine Components P. Ltd.
High Pressure, Low Pressure and Gravity Die Casting, Tool Room, Machining, Painting, Assembly, etc. all under one roof. - High Pressure, Low Pressure and Gravity Die Casting, Tool Room, Machining, Painting, Assembly, etc. all under one roof. We manufacture & export wide range of crank case covers. These are coated with corrosion resistance coating for the durability. Use of superior grade gray iron & steel as raw material, enhances the product quality as well. 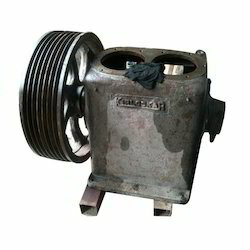 we are dealing in the Air compressor ci crankcase cover..